Yes I did, not in lottery my friends but at the fair. As I mentioned that in my entry here, it was about me and my partner went to the Fair in Meadville, PA. While walking around and enjoying so many different fair fun rides and the booths as well as the foods..hmmmm... yummy. We had decided to take some of the booth games there too. As I was too shy to exposed my talent [as if meron talaga], we choose to play the game [please figure this one out] you've got small pingpong balls that will be thrown in the middle with small tanks in the big table. You have to make sure that when you throw the ball it will get inside those tanks. And you'll win some prices, and I do got NEMO. 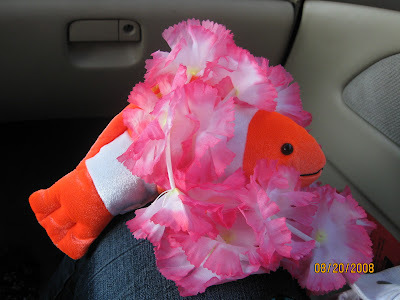 Nope, as you can see it is not the real fish instead the stuff toy one. Well, I was hoping to have at least 4 balls inside but still fortunately I got the one that would never dies. I was thinking that if I won here I could at least contributed a fish into my partner's empty tanks. Because his pet died, if you have not read it you can review it from here. So after winning, and met some Filipina on the fair [which I was so happy with] both were convinced to go home and rest our feet. Have a great weekend everyone! Ohhh.. it will be a long weekend too! COngratulations Novs! What such a cute winning piece you have in there. ^^ It feels great to win, right? WOw! cool winning stuffs Novs. Akin nalang yan uy! Hehe! I love stuffed toys! And nemo is cute. Galeng mo pala, Sis kasi u've won eh. Congrats! wow that was a cute price.. Congrats and sounds like you're having fun there.